"Although I have not been back to the house yet after this recent servicing, it has always been great in the past." Leader Basement Systems is the only authorized Basement Systems dealer in the greater Worcester and Springfield, Massachusetts areas as well as the Northwestern part of Windham County in Connecticut. Impressed with the integrity and innovation of the Basement Systems products, President and owner Craig Leader brings his several years working with Basement Systems into his own dealership. Craig Leader has been helping residential and commercial customers across Central and Western MA with issues in their basements and crawl spaces for over 12 years. Described as his "dream job," Craig enjoyment in providing solutions and keeping his word has resulted in referred customers and company growth. He strongly believes in integrity, honesty and customer service second to none. He is a devoted father, and enjoys bike riding, four-wheeling and playing guitar. Craig Leader is a trusted and valued member of our basement waterproofing network and brings high standards to the organization. If you have a wet basement or crawl space water problem in Massachusetts of any kind, call Leader Basement Systems and they will be there with experience and professionalism that will surpass your expectations. 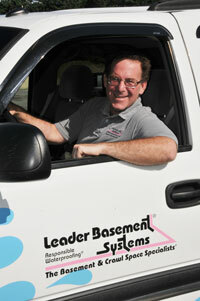 After all, basements waterproofing and dirt crawl space repair is their business -- it is what they focus on every day. Schedule a free inspection and estimate in Massachusetts, including Springfield, Amherst, Holyoke, Northampton, Westfield, Pittsfield, Shrewsbury, Worcester, Leominster, Fitchburg, Gardner, MA, and the surrounding areas. We currently serve Agawam, Amherst, Ashburnham, Auburn, Baldwinville, Becket, Belchertown, Charlton City, Chicopee, Clinton, Dudley, East Templeton, Easthampton, Fiskdale, Fitchburg, Gardner, Gilbertville, Grafton, Granby, Great Barrington, Hinsdale, Holden, Holyoke, Hopedale, Housatonic, Huntington, Lancaster, Lee, Leicester, Lenox, Leominster, Longmeadow, Ludlow, Lunenburg, Milford, Millbury, Monson, North Amherst, North Brookfield, Northampton, Northborough, Northbridge, Oakham, Oxford, Palmer, Petersham, Phillipston, Pittsfield, Rochdale, Sheffield, Shirley, Shrewsbury, Shutesbury, South Amherst, South Hadley, Southbridge, Southwick, Spencer, Springfield, Sterling, Stockbridge, Sturbridge, Sutton, Uxbridge, Ware, West Boylston, Westborough, Westfield, Westminster, Wilbraham, Winchendon, Worcester, and all surrounding areas in MA as well as Thompson, CT.